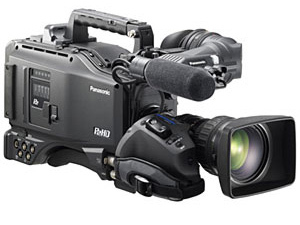 The Panasonic HPX2000 is a multi-format HD production camera that records onto P2 cards. Using the same sensor as the popular VariCam and HDX900 cameras, the HPX2000 can shoot native 720p or switch to shoot 1080i with 24p, 25p & 30p capture. Standard definition NTSC or PAL recording is also available. The AJ-HPX2000 P2 HD shoulder-mount camcorder integrates native HD progressive 2/3" 3-CCD performance with the ultra-high reliability and speed of P2 solid-state recording. As one of the most flexible, full production-quality cameras available, the AJ-HPX2000 records pristine high-quality images in over 30 HD and SD formats ranging from 1080p, 1080i, 720p, 480p, 480i and 576i. With the new AVC-Intra codec option board (AJ-YBX200G), the AJ-HPX2000 can deliver 10-bit, 4:2:2 master-quality video for outstanding video production and news acquisition. AVC-Intra, the industry's most advanced compression technology, is a professional intra-frame video codec with bit rates of 50 and 100Mbps, utilizing the High-10 and High-422 profiles of H.264 respectively. AVC-Intra provides high-quality 10-bit intra-frame encoding in two modes: AVC-Intra 100 for full-raster mastering video quality, and AVC-Intra 50 Mbps for DVCPRO HD quality at half the bit rate, thereby doubling the record time on a P2 card. The AJ-HPX2000 holds up to five P2 cards offering users extended recording time. With five 32GB P2 cards, professionals can record over 5 hours of content with AVC-Intra 50 and over 6 hours in DVCPRO HD 720p native.